This is a nifty stitch! While knitting my swatch, the edges were curling so depending on what you are knitting, you may want to consider a border. Pattern Note: To gather stitches: Slip the right needle under the 3 strands, from bottom to top so that you are in position to knit the next on the left needle. 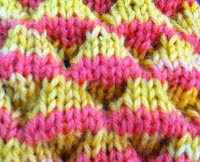 Knit the next stitch, pulling it under the slipped stitches. When you gather the stitches, you will be purling the stitch instead of knitting it. I found a crochet hook helpful with this step, otherwise it is next to impossible! Repeat these 16 Rows for pattern. As always, if you learn by seeing, below is a video. 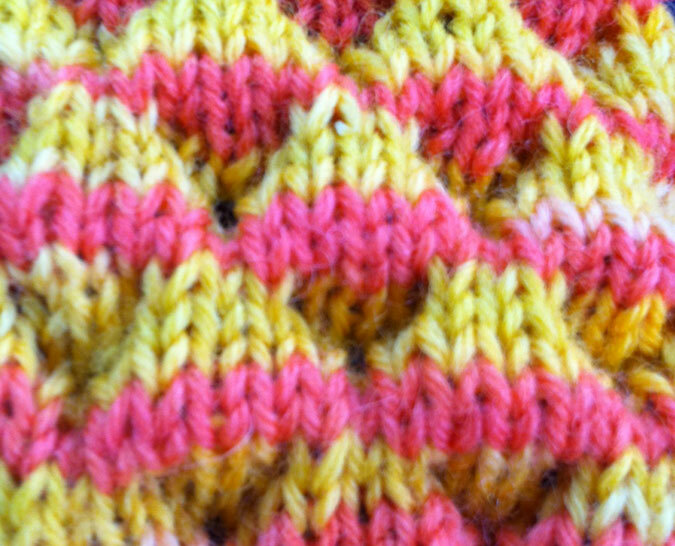 The video demonstrates the slip stitch rows, and the gather rows. The knit/purl rows are not included for the sake of brevity. Also is a brief video for this done in the round, to show the slipping and gathering of stitches. Enjoy! Thank you so much! I've been searching for this stitch pattern since I saw it on a cute hat over a week ago, and I kept trying words (bubble, puff, NOT bobble! ), so I was very excited to see this post, and especially the video (which explains the gather stitch perfectly). This is soooo nice! Thanks so much! The video is so great and helpful! Could you tell me how to do this stitch with two different colors like you did? Which rows do I change colors on? Thanks for your help! I used self striping yarn.